The Image Society, a non-profit association for the advancement of visual simulation and related technologies, has selected this image as October’s Image of the Month. This image belongs to STAR Center, the maritime training center in Dania Beach, FL operated by the American Maritime Officers Union. 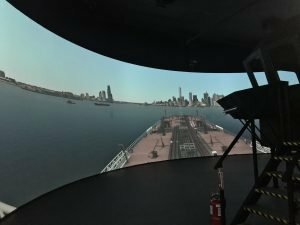 The 360 degree screen is 16.5′ high and has a 33.5′ radius and provides a realistic and fully immersive experience for ships pilots and officers. It utilizes Scalable Display Manager to warp and blend nine WQXGA projectors.